In the Woods is by far one of the most clever novels I have ever read, and the story is truly unforgettable. In the Woods is the first novel by Tana French and also an Edgar Award winner. In the Woods is also the first novel in what is now a trilogy and features detectives Rob Ryan and Cassie Maddox. Twelve-year old Rob Ryan (formerly known as Adam Ryan) was playing with his two best friends in the nearby woods when they disappeared forever. Rob was found flattened against a tree wearing shoes filled with blood and no memory whatsoever of what had happened; his friends never seen again. Years later, Rob is now a detective but he must face his childhood trauma once again when another local child goes missing. Upon investigating the crime scene, Rob and Cassie find an old hair barrette belonging to his best friend who went missing years ago, thereby seeming to link the two crimes despite the number of years that have passed. Working diligently together as partners and best friends, Rob and Cassie may kill two birds with one stone and solve both crimes. First of all, how can a reader not be intrigued with the synopsis?! A child is found with no recollection of a heinous crime, yet is found with puddles of blood in his own shoes and no other wounds? What exactly happened?! The journey to discovering these answers is just one of the many appeals of In the Woods . Rob and Cassie have amazing chemistry together which Tana French creates expertly with smart, witty dialogue, as well as providing explicit descriptions and significant details on their relationship. I'm pleased to see that the aftermath and success of In the Woods has spawned more novels featuring the Rob/Cassie duo. 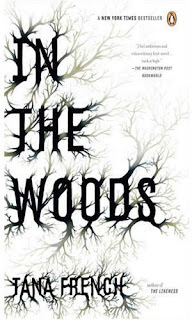 Another great feature of In the Woods is of course, Tana French's overall writing style. The direction she points the readers in is wholly unbiased, and she allows us to come to our own conclusions without influence. This alone is an amazing quality to have when writing complex mystery novels. As a seasoned reader and mystery fan, it isn't difficult to determine the evildoer behind the recent murder being investigated by Rob and Cassie; however it's still Adam Ryan's story and his bloody shoes that keep us going steadily through to the end. Following In the Woods is The Likeness (2008) and Faithful Place (2010). I can't wait to read more adventures featuring Rob Ryan and Cassie Maddox! I highly recommend In the Woods to all readers.